Zhuhai Yuxun Coaxial Cable Co., Ltd.
CCTV cable connect the cctv security cameras to VCR,DVR or PC based DVR system with ease. Multi-core coaxial cables are used for interconnecting equipment for digital telephone and data links,transmitting video,audio and data.The numbers of small cables inside can be up to 24 fores. zhuhai yuxun coaxial cable Co.,Ltd. is one of the leading professional manufacture in china,specialized in producing cables that transmit the signal of video and audio. Pre-made cable assembly are great for ease of installation,the ends are already formed on the cables. 2.Different length for choose according to customer's request,from 1m to 100m or more. 3.High quality connectors to fit on the IP camera and HD SDI camera. 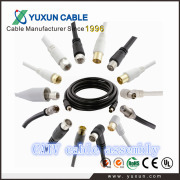 FOR MORE INFORMATION CONTACT ZHUHAI YUXUN COAXIAL CABLE CO., LTD.